Some people are prickly lots and a trial to deal with. In Farsi we have a saying for challenging beings like that: “bah yek man asal ham nemish’eh khord’esh” which translates to: “you can’t eat ’em with even a bushel of honey.” That’s unpalatable personality for you. In pleasant contrast, some people are unassuming rays of sunshine who effortlessly brighten up anything and everything by the virtue of their mere presence. Now if this type of person (the delightful one) was a Persian food, it’d be mast’o khiar: a cool, simple and healthy side dish that is particularly perfect during the dog days of summer and remains a welcome addition to the dinner table year-round as well even in the dead of winter; a dish that goes well with meat, rice, bread, and almost all Persian food (except let’s say fesenjoon!) and enhances whatever you serve it with. 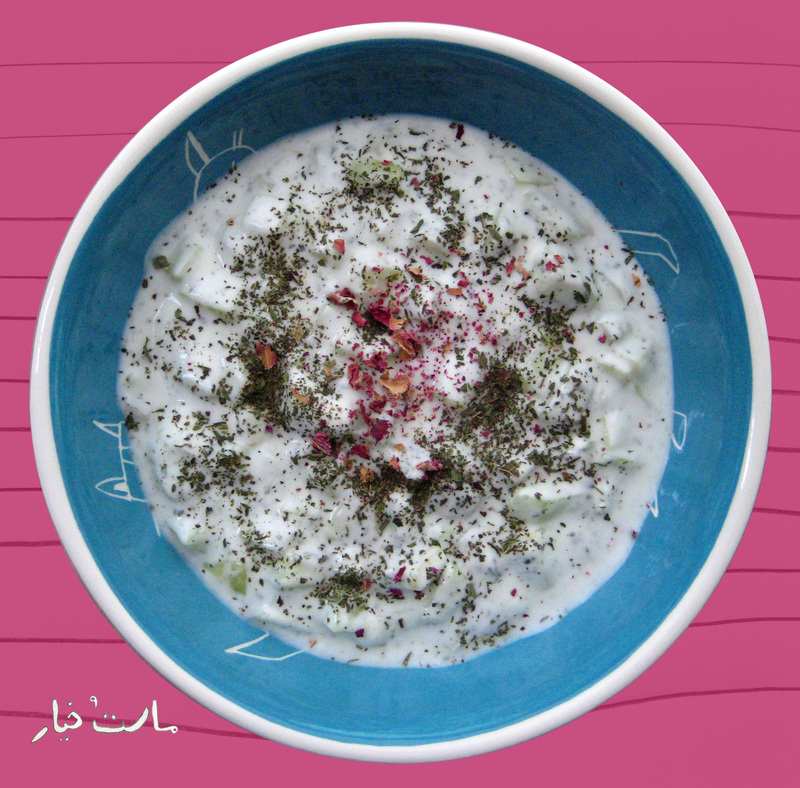 I personally am a devotee of the Iranian custom of enjoying a side of yogurt with most dishes and this classic cucumber & mint yogurt concoction, fragrant and crunchy and still creamy, takes it to the next level. So simple, so good. You won’t need honey to force this honey down your throat. There are minor variations on making mast’o khiar but for our bare-bones basic version you just need: yogurt, dried mint, good firm cucumbers, and mad dicing skills. That’s it. (Some people also like add a couple of cloves of minced garlic into the mix. We heart garlic but … no, not with mast’o khiar.) This foundational formula can be easily amped-up by adding fresh mint sprigs, roasted walnuts and raisins; and traditionally, particularly if it is to be served at a dinner party, one sprinkles mast’o khiar with a Jackson Pollock flourish of dried rose petals (pretty!) for enhanced sensory charm. Pour yogurt in to a serving bowl and stir in: 1 teaspoon salt, 1 teaspoon dried mint, and the chopped fresh mint if you’re using that. Mix well. 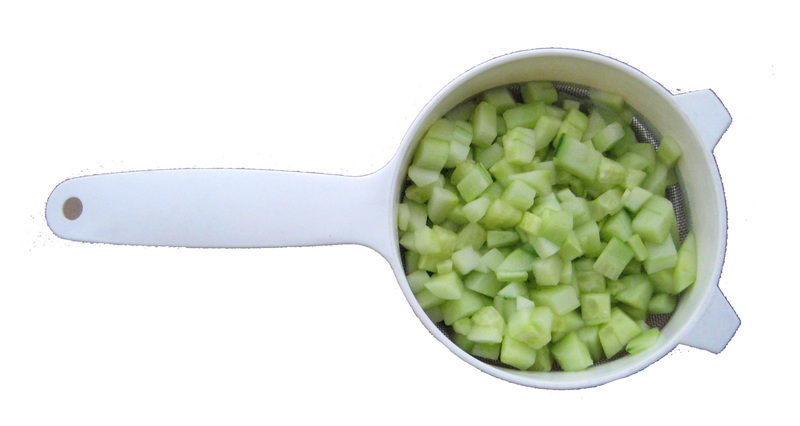 When ready to serve, mix yogurt with diced cucumbers. If using walnuts and raisins (and you really should) now is the time to mix them in as well. Taste and adjust salt and pepper to taste. Sprinkle with 1/2 tsp of dried mint as a decorative garnish. 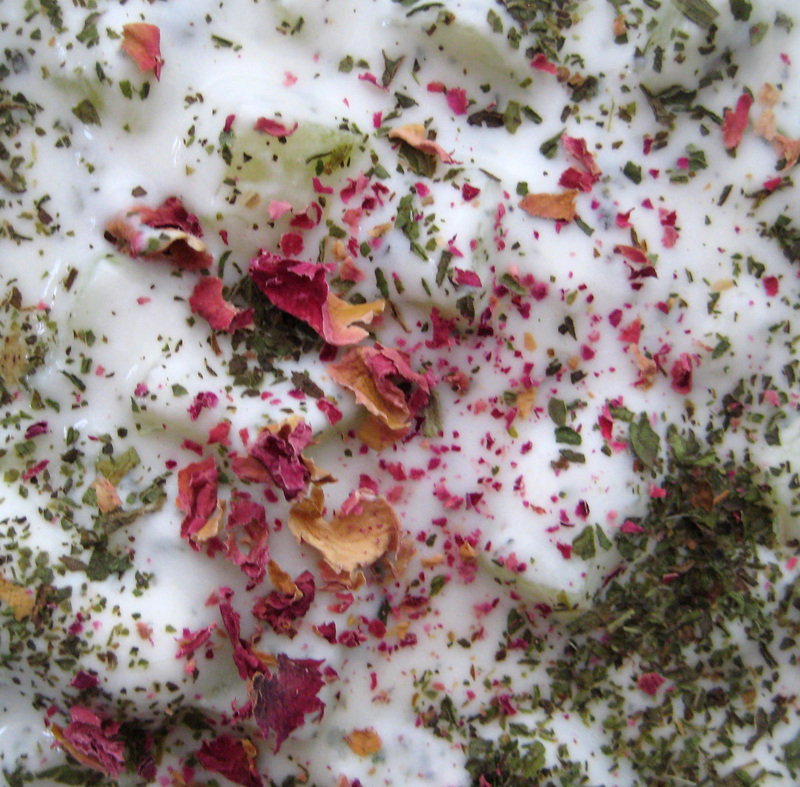 Finish with a flourish of dried rose petals (coarsely ground rubbing between your palms) sprinkled artfully for a touch of amplified sensory delight. Serve! Note: This dish is best served immediately as it does not keep well. The culprit is cucumber because it gets watery pretty quickly – thus diluting the yogurt mixture and spoiling its its texture and pizazz. However, there’s a way around this for those willing to go the extra mile: after dicing cucumbers sprinkle with a restrained touch of salt and put in colander and drain for half an hour. Taking this step should allow you to keep it for at least a day or two. Customarily, mast’o khiar is served as an appetizer or side dish; but it also can do double-duty as a marvelous and healthy dip, makes for a darn good snack, and can be a refreshing and light stand-alone repast (specially if you mix it in with the walnuts and raisins ) with some bread. Make it and enjoy it and noosheh jaan! I love how you suggested it’s not so fab with fesenjoon 🙂 You’re funny and abbbbbsolutely correct. I know! Just imagining the two together … ah: no! Did you ever make the shirin polo? No! I’m so bummed! We had a friend over for Dinner so I went with Lubia instead. And totally burned the potato tahdig. I alllllways burn it. I cook it on medium for 5-8 minutes then reduce it to med-low for like 40 minutes. I think maybe that’s too long? You don’t have much luck with lubia polo, do you? 😉 Tah Digh is challenging! But fret not, we’re going to have a Persian Rice 101 post soon that will answer all! I’ve got the lavash tah dig down. But the stupid potatoes are driving me bonkers… I’m wondering if some of the mayeh is getting to the bottom of the pan and burning the potatoes? I love the way you put it: easily the hardest part. Ha ha and so true. I’ll have to quote this and some other parts. 🙂 I’ll be in touch re the rice post – thank you! Gorgeous! I’ve a jar of dried rose petals just to make this, are there other dishes you use them in? Looking forward to Persian Rice 101, and learning how to get a delicious crust on the bottom. I really like your writing! And this looks delicious! What a great idea of the mint, rose petals and cucumbers; triple yummy!!! Hi Azita! Love your images! Mast-o-Khiar is on Chef Zia’s menu for this Saturday at the Kalamazoo Farmers’ Market – rose petals included! At the Persian Kitchen blog, I found this: “Mast-o-khiar is referred to both as a soup and dip version of this dish. 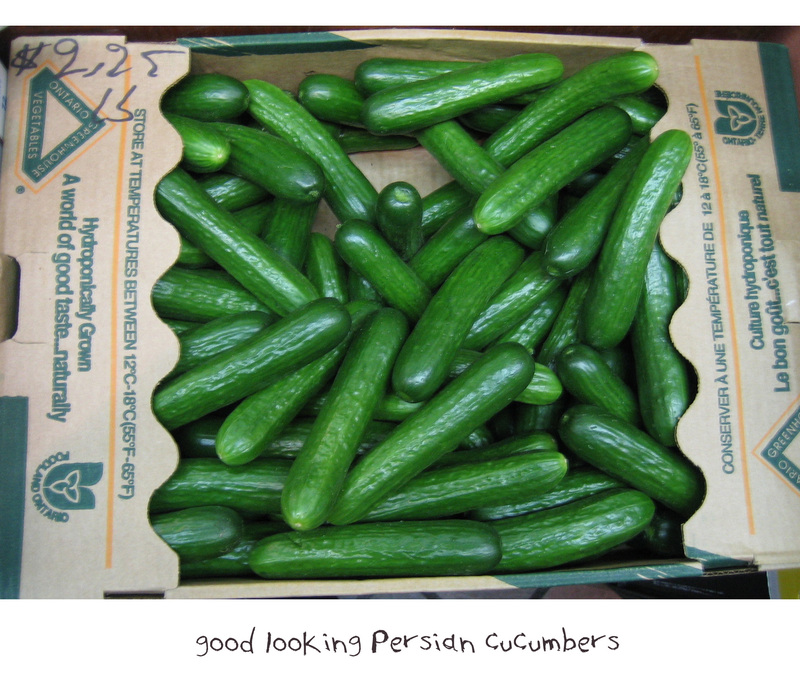 While they are both made with yogurt and cucumbers, I personally use different ingredients when making each dish”. Would you say that your recipe is more common for the dip/side dish, but the ingredients you mention to take it to the next level? Would those ingredients make the Mast-o-Khiar a soup? I’m trying to practice pronouncing Mast-o-Khiar – think I have it! But what does mast mean? And what does khiar mean? Thanks so much! Thank you for visiting, reading, and commenting.